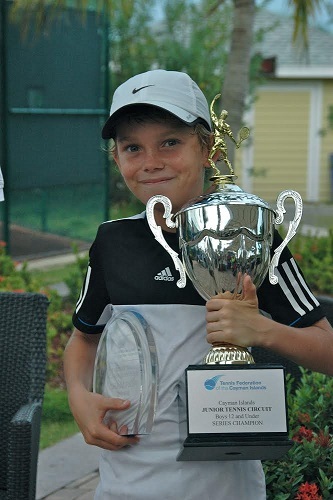 (TFCI): Last weekend’s PwC junior tennis Masters Championship was full of surprises, as three out of the four top seeds fell to lower-ranked players. Callum Theaker beat top seed Daniel Reid in the 18&U group; Jake Serpell defeated powerful Oskar Bjuro in the 10&U; and Calum Lindsay took out Harrison Clough to secure the 14&U Masters title. The only No.1 seed to claim a Masters crown was Jack Lomax, who remains unbeaten this year in his 12&U division. Reid, 16, was a little unlucky going into the 18&U final with Theaker, as he had already played a tough three-setter only a couple of hours earlier against Brad Johnston. Theaker, on the other hand, got a bye when his semi-final opponent Jade Wilkinson was forced to withdraw with an injury, so went into the match fresh. Theaker, 14, the No.2 seed and Reid’s chief opponent, proceeded to take the match 6-2, 6-1, but it was clear Reid was playing well below par. Reid accepted his loss with grace, but he nevertheless easily emerged with the most points over the year in the 18&U division, and finished ranked no. 1 and 2014’s champion, an honour recognised by a large trophy. Theaker finished the year as No.2. Calum Lindsay’s hard-fought victory (5-7, 6-3, 10-8) over Harrison Clough in the finals of the 14&U group was a big upset. The fifth-ranked player in this division, Lindsay, 12, was expected offer little serious resistance to Clough, but he proved he was not so easily dismissed. With his intelligent, consistent game, he ultimately squeaked past his aggressive but more error-prone opponent. Despite the loss, Clough, aged 11, finished the year as the No. 1 ranked 14&U and was named 2014 14&U PwC champion. The player who earlier this year dominated the 14&U division, talented Bobby Lomax, is taking a break from tennis, so did not take part in the Masters. While Jack Lomax, 9, cruised through his matches to win the 12&U division, the player who grabbed the crowd’s attention was finalist Neildeep Ghosh. Ghosh, ranked outside at no.4, earned his way to the semis, where he held his nerve to scramble past no.3 seed Alex Claybourn (1-6, 6-3, 12-10) to make the finals. There, he put up a strong fight, succumbing 3-6, 3-6 to Lomax. This was a great result for Ghosh, who finished as runner-up in front of no.2 seed Lauren Fullerton and no.3 Claybourn. Lomax, who plays above his age group, finished the year as the 12&U champion, and also took home a plaque for winning the Masters. Bjuro in October’s fourth PwC tournament of the year was no accident when he won their final on Sunday, 6-3, 6-3. Serpell clocked up wins against Ella Beighton and Caden Stradling to make the semis, where he dismissed Todd Purton 6-1, 6-2. Bjuro, for his part, beat younger brother Sebastian, Holly McLean and Todd Purton, before coming up against Caden Stradling in the semis. Stradling, who applies plenty of pressure with his aggressive play, almost unseated Bjuro, but eventually went down 4-6, 6-4, 11-13. Serpell’s win over Bjuro in the finals means he may well be one to watch in 2015, along with Stradling. Bjuro nevertheless finished the year claiming the no.1 ranking by a comfortable margin, and collected a large trophy as 2014’s 10&U PwC champion. The Masters – to which only the top 8 in each age group are invited — was held at the Courts at the Ritz-Carlton on Saturday and Sunday, with the finals on clay courts on Sunday afternoon. Trophies were awarded by PwC’s Charles Bolland. The PwC junior tennis circuit is run by the Tennis Federation of the Cayman Islands, with the help and support of local pros.